Unherited from Crystal Focus Saber Core, Voice Core is dedicated to voice transformation with static burst effects. It's particularly adapted for troopers and bounty hunters. The module is quite original since it provides a comm / radio / walkie-talkie like effect, amplifies the voice to the outside of a helmet and adds the classic static burst that often ends a radio transmission. The module can also add distorsion and noise background on the voice. Static Phasing : artificial voice color, but very easy to understand, it doesn't break the prosody too much. An important phasing value leads to an Echo Fx. Watch the latest video at the bottom of this page to discover the newest features and the various combinations that can be obtained ! Fully engineered and built by Plecter Labs, this electronic board allows you to play digital quality sounds for the sound effects. The board embeds a removable SD card and plays 22.050 kHz / 16 bit sounds. Those sounds a totally changeable by the user with a simple and inexpensive USB card reader. The effects and behavior of the board is setup in a text configuration file stored on the SD card that hosts the sounds ! The module plays back several static burst sounds selected in a sequencial or in a random way (for more realism). The module also features a push to talk control if the user prefers to trigger the voice amp and fx with the control of a momentary switch instead of voice loudness detection. Sound is sent directly to speakers (like the ones from triktoys that fit the breathing vents), or to an external amp (provided) or to both ! Our module also embeds a DSP algorithm to reasonnably stay away from echo and feedback (larsen effect). ►The module is provided ready to work with a SD card preloaded with static burst sounds and configuration file. Other static sounds sets will be available from the download section of the website. Compatibility : audio input by mini jack for a multimedia microphone (provided). 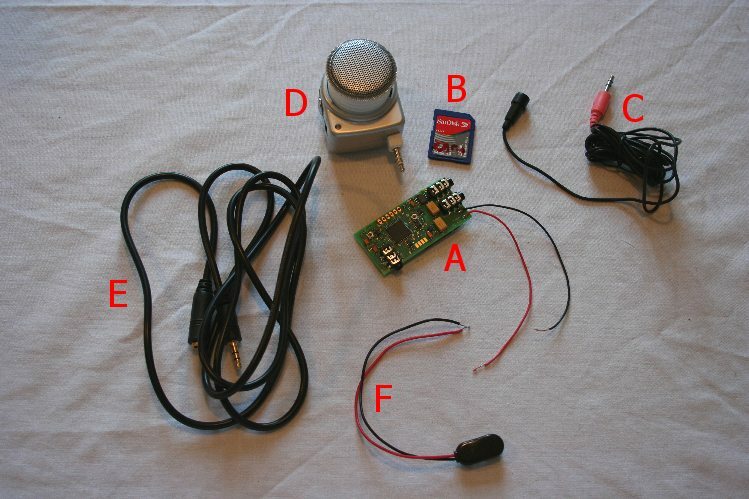 Output 1 : entrée audio mini jack stéréo type microphone multimédia (founi). Sortie 1 : mono mini jack to speakers with onboard amp (8 ohm or 4 ohm, 1W). Output 2 : mono mini jack to external amplifier (line level).